I’ve ALWAYS loved the Miami Heat. Since day 1. I was pregnant with my amazing Caitlyn when they entered the NBA. I swear, that child must have inherited the Miami Heat genes while in the womb. Cat5sports.com is her blog, and she is one of the most knowledgeable, enthusiastic loyal fans of all SoFla sports teams. The girl knows her stuff. She revels in correcting her whack Mama ALL THE TIME, see I am a fan of PASSION, some knowledge, and understanding of the game, but MY love of this team is not just about the “Stats”, and educated predictions and technical side of stuff..but from my SOUL. I SINCERELY LOVE THIS TEAM. The players, coaches, philosophy, and the organization as a whole, and EVERYTHING that encompasses this phenomena. I am a DIE HARD fan. Regardless of win/lose/draw/good/bad/off/on. I am LOYAL, unwavering, hopeful, relying on my own inner fortitude FOR the Miami Heat. I am a tried and true blue fan till my last breath. I grew up in SoFla, and ALWAYS supported my local teams. The MIAMI HEAT though, they are iconic, and SUCH a great team to follow. I LOVE the loyalty, commitment, and attitude of “The Family”. now known as #HeatNation all over social media. Having been traveling for the past several years with my job, thus being located in some “challenging” environments, I have come to use the Miami Heat as my true North so to speak. It represents Stability, Loyalty, Commitment, Fortitude, and..Home. When I can’t get the games via live feed, I ALWAYS go to Twitter..THANK GOD FOR TWITTER!.. Twitter has been my communications salvation on more than one occasion. There have been numerous times when I have been stuck with NO comms, mainly because of the areas I have worked, but-no matter, no how- Twitter, has NEVER failed me.. I have spent many an early AM in Baghdad at 03:00, REALLY WISHING the internet would allow me to catch just a GLIMPSE of my boys!…during 2011 it was rare, BUT..Twitter came to my rescue, I was able to keep up just by following the feeds and updates, thus allowing me to know the scores during games. It’s become my “go to”. And, no matter where in the world I happen to be, I am ALWAYS on Twitter, especially enjoying #HeatNation peoples posts. It has built itself quite a large fan base over the years. I am currently in AU, which is 16 hours ahead of EST. SO, I get to catch my boys playing usually at 11:30 AM the NEXT day here whilst the SoFla locals are eating chicken wings, and downing pitchers of micro brew, I’m having my 4th cup of coffee, and doing breakfast dishes while NBA League pass blares from my Mac. THANK GOD for technology, and a halfway decent internet bandwidth. I am currently standing by to head back to Iraq, and have these delusions of grandeur that NBA League pass MAY work there.. ( ONE CAN DREAM, WILL, WISH, VISUALIZE, AND HOPE!) Otherwise, it’s back to the reliable Twitter feed. But, for NOW while I’m the quintessential Miami gal in Oz, REPRESENTIN the Miami Heat here, downunda, I will watch EVERY SINGLE GAME, because I CAN. And, WHILE I can, I will watch this amazing group of guys play their hearts out, and visualize, will, wish, and intend for the Miami Heat, to take it all the way. I just FEEL it..
My amazing Caitlyn laughs, she always gives me the ‘Oh Mom”..lol..and tells me it’s a “nice thought”, but “unlikely” because of the “Stats”. She KNOWS basketball. in and out. but my HEART knows a passion that may surpass all that!…at least she is amused with my undying passion, my WILL for them to win..as do all the naysayers, that know LOTS more about basketball than I do. But, I STILL debate them, to the end. I STILL FEEL IT, in my HEART (” but, your HEART doesn’t win NBA games, Mom”).. No, you are correct, my heart doesn’t. But my heart FEELS the pride, joy and PROMISE that this organization brings to so many of us in each game they play. And my heart is what makes me feel what THEY feel, whether it be a win,or loss. My heart is WITH them, always. 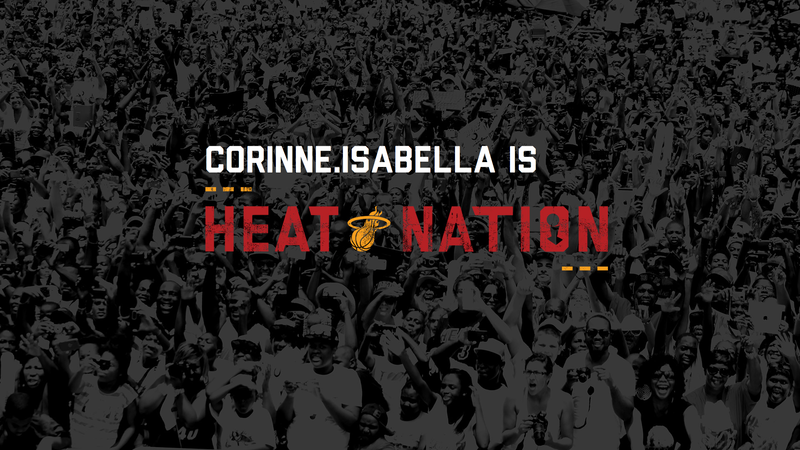 I am #HeatNation. I am a #HeatLifer. I am a #MiamiHEAT fan. loyal till the end, Ride or Die. #LETSGOHEAT.